We often think of childhood as the golden age of freedom and exploration. Both free play and structured learning are integral to motor and cognitive development in the early years, as well as enriching the imagination and sense of wonder at a young age. Nothing is more awe-inspiring to a developing mind than the majesty of nature and the seemingly limitlessness of the outdoors. As families move further and further from rural areas, however, opportunities for youth to freely explore nature become increasingly limited. Our rapidly urbanizing society incurs the cost of reduced access to unspoiled woodlands and streams for many children, an entire generation that could miss out on the benefits of nature play. In 2005, child advocacy expert Richard Louv published Last Child in the Woods: Saving our Children from Nature-Deficit Disorder. The best-selling volume outlines the consequences of dwindling access to nature on emotional and physical health. The majority of children used to have access to rolling hills and bountiful forests to scamper through, but today’s youth are increasingly reliant on backlit screens for sensory engagement instead of parks and preserves. For children to grow up fully understanding the importance of nature, they must be given the freedom to safely play in natural landscapes. Minnesota Zoo Hanifl Family Wild Woods Playscape, Apple Valley, MN. Photo credit: Damon Farber Landscape Architecture. In the wake of these concerns, communities are responding to the need for accessible and enjoyable outdoor space. Landscape designers are incorporating exposure to nature in built play spaces through the use of natural materials in settings as commonplace as school playgrounds and public parks. Imagine a world where all playscapes are designed to embrace nature, where children run freely on dirt instead of concrete and climb tree branches instead of steel poles. A naturally themed playground encourages exploration and exposure to nature within a safe and carefully designed setting. Features such as logs, boulders, plants, and streams are arranged in order to invite children to investigate using all of their senses, and formulate early impressions of natural elements. The incorporation of outdoor wisdom into childhood development has even spread to early education, including a handful of "nature preschools"that engage the imagination and foster enthusiasm for nature. Organizations such as the Boston Schoolyard Initiative (BSI) have advocated for incorporation of nature in schools. Between 1995 and 2013, BSI’s collaborative of landscape architects, artists, horticulturists, and other experts developed design tools and kits of parts to promote creation of outdoor classrooms across the country. As we see a resurgence in nature-based play and learning, we can hope to raise generations of children for whom loving nature is a way of life. Photo credit: Damon Farber Landscape Architecture. WholeTrees playscape elements can be seen in abundance throughout the Hanifl Family Wild Woods landscape project at the Minnesota Zoo, designed by Twin Cities landscape architecture firm Damon Farber. WholeTrees’ black locust round timbers are fashioned into playscapes, log steppers, climbing structures, and even an elevated “treetop” maze. The use of trees helps develop visual and tactile connections with woodlands in a playful but elegant manner. Additionally, the trees were harvested from FSC-certified Wisconsin DNR black locust stands. 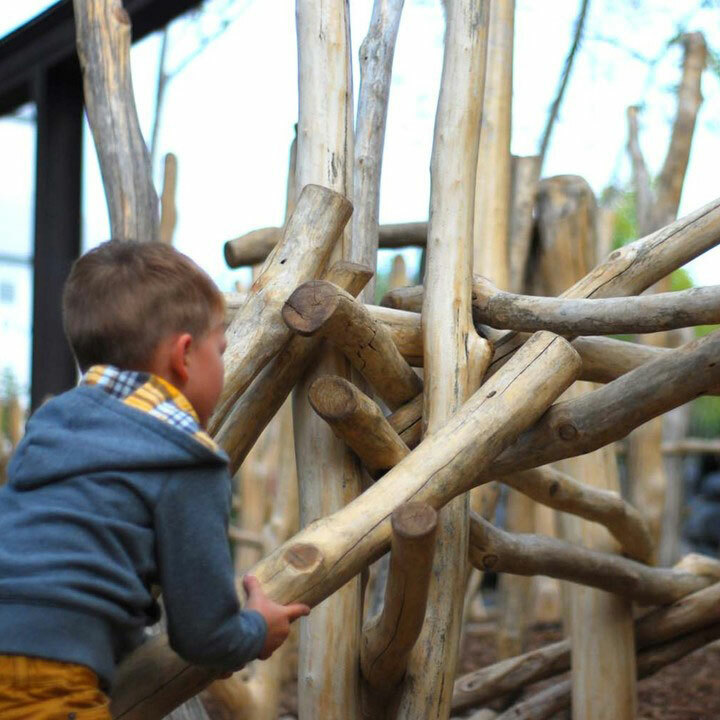 Using these invasive timbers transforms forest waste into a beautiful and abundant natural resource, at a much lower cost to our natural environment than comparable play structures made from steel or concrete. Using natural materials not only reduces harm to the environment, but increases its positive impact on children at a crucial age. Future generations of leaders will continue to steward our environment if they understand and embrace it from an early childhood. Those who grow up in nature become those who are most motivated to protect it, so the means for natural exploration must continue to reach children in urban and suburban communities. Incorporating natural elements into our playscape designs not only improves children’s appreciation of the natural environment, but also serves to protect our collective dream of a greener future.